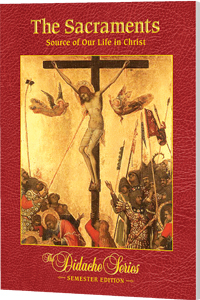 This Student Workbook is an accompaniment to The Sacraments: Source of Our Life in Christ; it allows the student to engage the Seven Sacraments through compelling and meaningful exercises. Using combinations of multiple choice, fill in the blank, and short answer questions, the students recall and apply concepts from the textbook to their own lives. The textbook, The Sacraments: Source of Our Life in Christ, corresponds to Book V: Sacraments as Privileged Encounters with Jesus Christ in the curriculum framework.